Antwerpen. 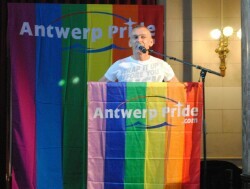 In Antwerp, the third edition of the four-day gay event 'Antwerp Pride' has started. From Thursday through Sunday, the rainbow flag in Antwerp can be found in many places in various events where diversity and LGBT focus . According city council for Tourism and Culture Philip Heylen (CD & V) reveals that Antwerp, Antwerp Pride a hospitable town where everyone is welcome. The presence of the annual congress of the International Gay & Lesbian Travel Association (IGLTA) that all three hundred participants and up to 44 international press teams brought to Antwerp. international gay tourism has long been a valuable niche market. How many people Antwerp Pride 2010 will be is difficult to predict. "Last year we were at 50,000 participants," said organizer Bart poplar. "But the good weather and our growing reputation, we hope this weekend to go." The White Party at Steenplein (Saturday) and the closing party in front of Cityhall (Sunday). IGLTA is presenting the Saturday street fashion Kammenstraat with a real gay friendly travel market. The opening of the DAA Friday at 11 am, attention to the Pride. DDA stands for Designers Against AIDS is a project of Beauty Without Irony which was founded in Antwerp in 2004. The International HIV / AIDS Awareness Education Center (IHAEC) is the recent project of DAA. The pride was opened with a reception and opening party at CafÃ© de Draak. A delegate of the European Commission gave a donation of 3000 condoms will be distributed during Pride events. And remember the more than 40 parties in the many gay bars In Antwerp City.